A delicious combination of sweet, savory and spicy, this recipe is flavorful and the perfect blend of comfort food kicked up a notch! Prepare the potatoes first and place them to the side until ready to roast. Cube the potatoes with a large cutting knife then add to your large bowl. Toss with olive oil then add your spices and toss again. The more jalapeno powder added the spicier they will be. 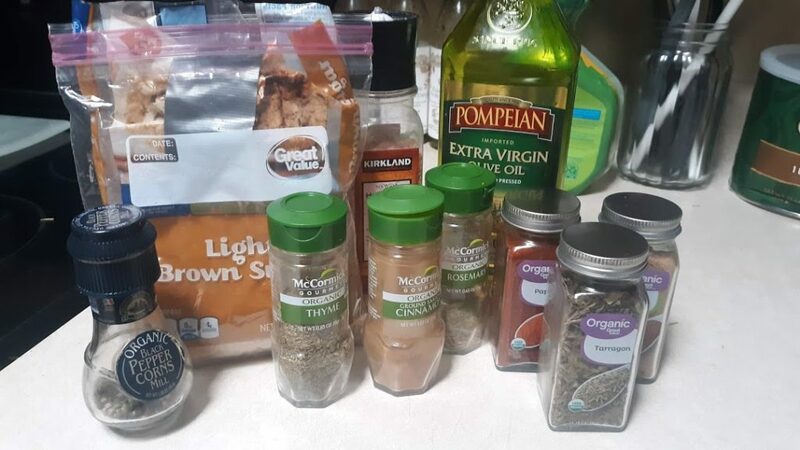 The other spices can be pretty mild, as long as you aren’t dropping the whole shaker into the bowl. Taste test as you add. I always add plenty of rosemary to mine. I use a little more discretion when it comes to the salt, pepper, thyme and garlic powder. But use as desired. I recommend tossing with your hands once all the spices are in. 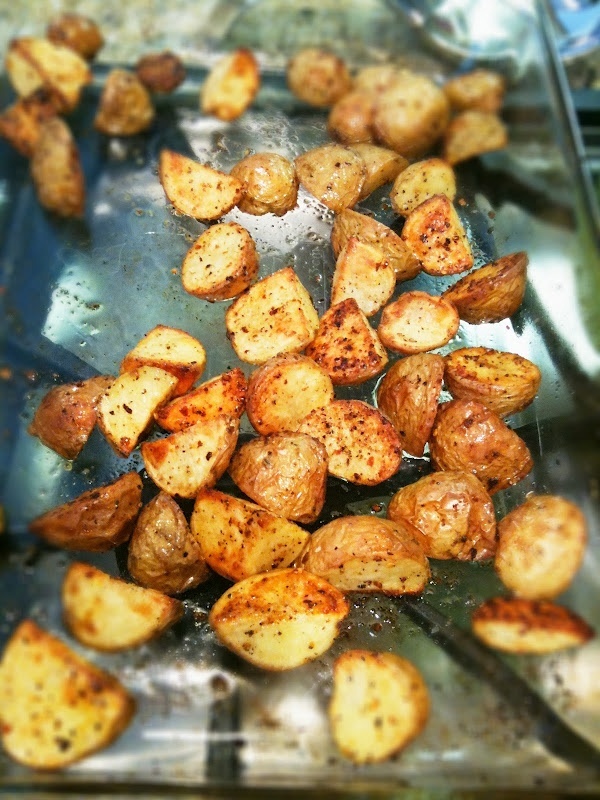 Spread your potatoes out evenly on a baking sheet and place to the side until ready to roast. Nex, prepare the mandarins. Cut your mandarins in half and squeeze the juice from them into a bowl. Get as much juice as possible. Next remove the flesh from the peels. You can discard the flesh. Thinly slice the mandarin peels into strips. Place to the side. For the onions, remove the top layer of skin and cut into thin slices. Then, in a large cooking pot, add about 2 tbsps of olive oil on medium heat. Sautee your onions on the stove until they turn a light golden color. Place them to the side. As for the chicken, remove the giblets from the inside, you can discard them or use them for another dish if desired. Rinse your chicken in cold water, then pat dry with paper towels. Line your casserole dish with aluminum foil, be sure there is enough foil to wrap your chicken in once it is prepared. 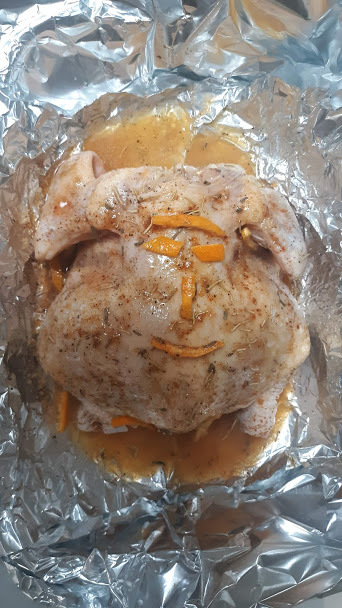 Place your chicken on the aluminum foil and fully coat your chicken in olive oil. Use your hands to coat it. Next add your seasoning to it. Use plenty of salt, pepper and rosemary on all sides. Rub about a 1/4 cup of light brown sugar all over it. Add a few dashes of nutmeg and cinnamon. Top it off with another few dashes of paprika. Place your chicken to the side. 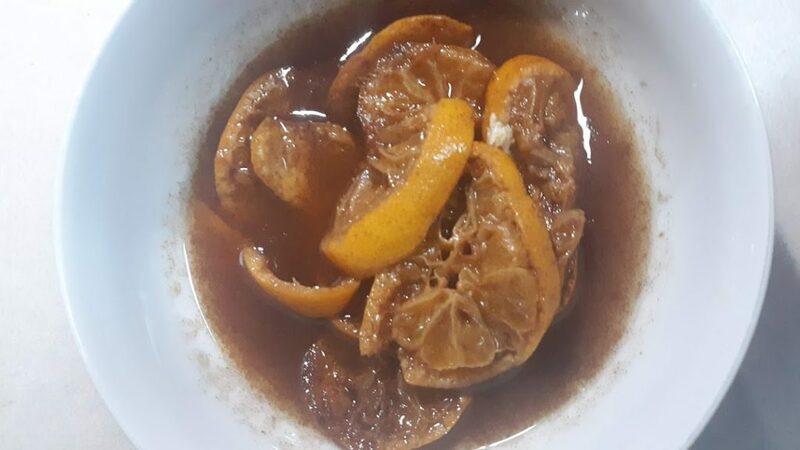 In the bowl with your mandarin juice, you will add more spices to the mix. 2 tbsps of light brown sugar, 1/4 cup lemon juice. Add only about 2 dashes of nutmeg and 3 dashes of cinnamon. Add rosemary, salt, pepper, thyme and only a pinch of tarragon. You can add a few dashes of onion and garlic powder if desired for a more savory taste. Mix all of the ingredients together with a fork. 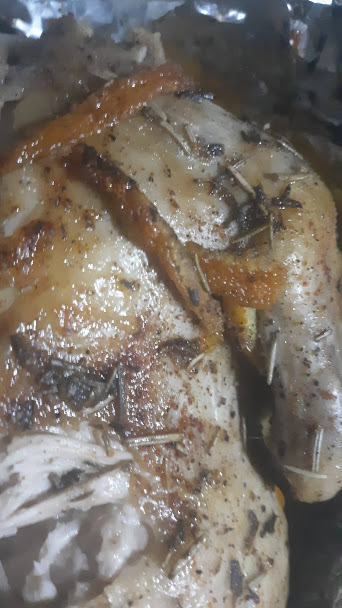 Into the inside of the chicken, the cavity where you removed the giblets, stuff your sauteed onion slices and mandarin peel slices inside. Then pour your mandarin juice concoction inside the cavity. The juices should ooze out slightly. You can add a few mandarin slices and onions on the top of the chicken for added taste and aesthetics. 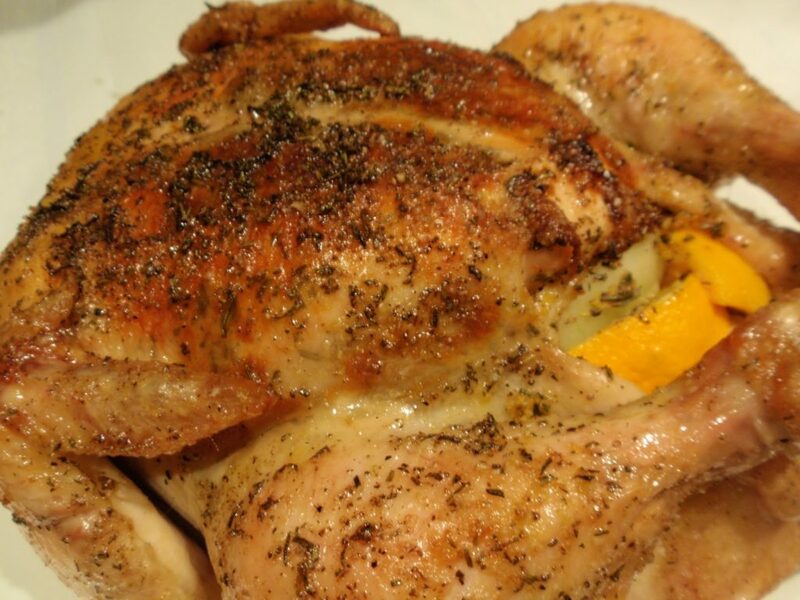 Wrap your chicken in aluminum foil and place in the oven to bake. Place your potatoes in the oven to bake alongside your chicken. Time accordingly.